Buckminster Fuller wrote, "We are called to be architects of the future, not its victims." 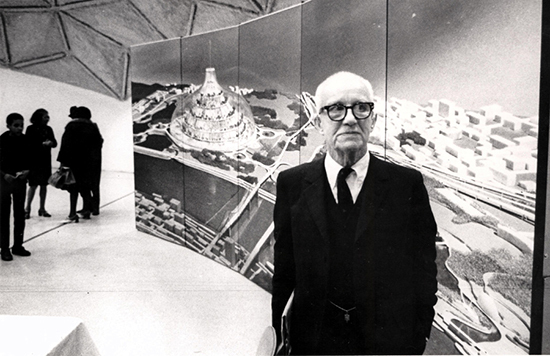 Speaking of architects, Buckminster Fuller was one. He was also a systems thinker and inventor responsible for the Geodesic Dome, the innovative and accurate Dymaxion map, and the futurist Dymaxion car, among many other things. Fuller also demonstrated his thought leadership by inventing a word: Ephemeralization, the ability of technological advancement to do "more and more with less and less until eventually you can do everything with nothing." According to Wikipedia, his vision was "that ephemeralization will result in ever-increasing standards of living for an ever-growing population despite finite resources." Nice vision. Bucky was a guy who could hack a paradigm. Portable Music Player, aka "Boom box" aka "iPod"
Box that plays movies through your TV aka "VHS Player" aka "DVD Player" aka "Blu Ray Player"
Elon Musk has given us more car with less (in fact, zero) fossil fuels needed in the Tesla: the first mass-produced electric car that I've wanted to own. Steve Jobs started a revolution with the iPhone, giving us more screen area, and thus a more usable computer, in a pocket-size smart phone by moving the dialing to the screen. The Amazon Kindle was at the forefront of making it possible to carry thousands of books around with you. Netflix has brought thousands of movies into millions of homes without the need for any physical media. Porsche is playing catch-up as the Paradigm Adapter to the Tesla with its Mission E, which looks pretty awesome but is lagging behind the Tesla Model S by many years in the marketplace, even if it launches when planned. Its parent company, VW, is the Paradigm Victim (by its own doing) - suffering through the repercussions of cheating its way to performance with diesels, a way of economizing our driving that is looking more outdated every year. Samsung as Paradigm Adapter followed Apple to market with products similar enough to Apple to trigger a stream of lawsuits. Blackberry, the Paradigm Victim kept their touch-keyboard to their detriment. Barnes and Noble played the Paradigm Adapter with the Nook e-reader while Borders Bookstores, with no e-reader of their own, wore the hat of the Paradigm Victim and failed. In video, Amazon has been the Paradigm Adapter with its counter to Netflix in the form of Amazon Prime Video. Blockbuster, saddled with a huge inventory of physical movie media, became a Paradigm Victim. 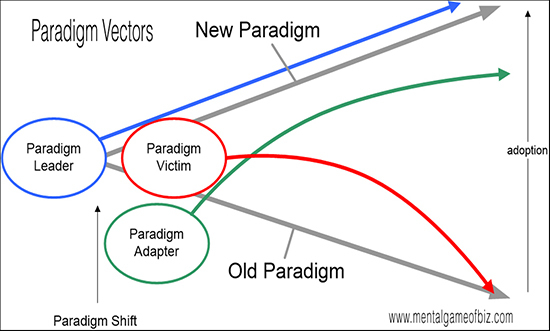 The greatest spoils, however, go to those who see the invisible and bring it to life: The Paradigm Leaders - those who can hack a paradigm, not just in themselves, but also in the marketplace.